The superpowers of the web are constantly coming up with new formats for online content. 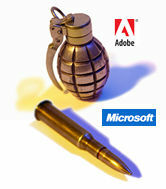 Over the past year we have seen Air from Adobe and Silverlight - the touted "Flash-killer" - from Microsoft. In addition, widgets, mashups, RSS feeds, AJAX, podcasts, wikis and more continue to gain ground. But, just cause they are new and cool - does that mean you need them? When should you say YES and - more importantly - when should you say NO to a new format? Read this post in full on the iQBlog.